The Jordan National Gallery of Fine Arts is one of the major art museums in the Middle East and houses a unique permanent collection of contemporary art. 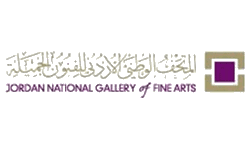 The collection comprises over 2000 works including paintings, prints, sculptures, photographs, installations, weavings, and ceramics by more than 900 artists from 60 countries mainly in Asia, Africa, and the Middle East. Mimmo Jodice was born in Naples. His name is well known in the history of Contemporary Photography. In early 1960’s he began to experiment different materials, abstract forms and all linguistic and technical aspects of Photography. During the 1970’s he was in contact with the most important avant-garde artists, such as Warhol, Beuys, Kounelis, De Dominicis, Paolini, Sol Lewitt, Kosuth and many others. In 1969 he began teaching Photography at the Academy of Fine Arts in Naples, where he taught until 1994.
a surreal and uneasy vision of urban landscapes, and a research of his roots and the myths of Mediterranean. Mimmo Jodice’s artistic shots dedicated to the Mediterranean interpret at best the spirit of Italian cultural diplomacy in the geographical space who’s our country is a vital center, crossroad of past and present, crucible of cultures and traditions. This constitutes the core of Jodice’s extraordinary study, between statutes and human faces, ancient ruins of history and plentiful landscapes that seem to hope for a bright future. Now more than ever, this call of the shared cultural heritage which characterises the Mediterranean as a place of peaceful coexistence and richness of dialogue and contamination, is necessary to build bridges against the walls of indifference and intolerance. غادر كوديلكا تشيكوسلوفاكيا للحصول على اللجوء السياسي في عام ١٩٧٠ وانضم بعد ذلك بوقت قصير إلى مؤسسة ماغنوم للصور. في عام ١٩٧٥، أصدر كتابه الأول، الغجر. وفي عام ١٩٨٨، المنفيين. منذ عام ١٩٨٦، صوّر بكاميرا بانورامية وأصدر مجموعة من هذه الصور في كتابه الفوضى في عام ١٩٩٩. وقد نشر كوديلكا أكثر من اثني عشر كتابا من أعماله ، بما في ذلك غزو براغ ٦٨ (٢٠٠٨)، وكان آخرها، مصنع المنفيين ٢٠١٧. Between 1962 and 1971, Josef Koudelka travelled through his native Czechoslovakia and beyond to rural Romania, Hungary, France and Spain. His main subject was the Romany Gypsies. Drawn to their nomadic lifestyle, rituals and customs, Koudelka took on a nomadic lifestyle on his own, often travelling with little more than a camera, rucksack and a sleeping bag as he journeyed into his subject matter. Koudelka’s stark images depict the simplicity of Gypsy life, but he does not present their situation as a social problem that should somehow be fixed. Instead, he shows the Gypsies as perpetual outsiders, and their lives as a primal mix of glee and wonder, sorrow and mystery. شاركونا اللقاء في المبنى رقم 2 للمتحف الوطني الأردني للفنون الجمیلة، دوار المنتزه، اللویبدة. We are pleased to invite you in the upcoming meetup of Hiwar Art Club on a discussion around the theories of Palestinian intellectual Edward Said and his contributions to the concepts of Orientalism and Post-colonialism and their impact on forms of art and culture, according to the reading from the book "Theory for Art History" by Jay Emerling. You'll find the assigned reading for the meetup in the comment box on the facebook page. The discussion will be in both Arabic and English. We are pleased to invite you in the upcoming meetup of Hiwar Art Club on a discussion around the theories of Palestinian intellectual Edward Said and his contributions to the concepts of Orientalism and Post-colonialism and their impact on forms of art and culture, according to the reading from the book “Theory for Art History” by Jay Emerling. You’ll find the assigned reading for the meetup in the comment box on the facebook page. The discussion will be in both Arabic and English. Hiwar Art Club” is an educational art hub organized by the Jordan National Gallery of Fine Arts open for all artists and interested individuals. On Saturdays, our audience is invited to participate in group discussions on a specific theme dealing with the critical, aesthetic, spiritual, decorative and pragmatic issues in art, in the hope of cultivating contemporary cultural knowledge among our joined members. Join our meetup at building #2 of the Jordan National Gallery of Fine Arts, Al Montazah roundabout, Al Weibdeh. As well as April 13th, Hiwar Art Club will be hosting the following events. 20 – April, 6:00 pm: A talk with our guest speaker Palestinian artist Nabil Anani, featuring also the signing ceremony of his latest book, “Palestine, Land and People”. 13- نيسان، الساعة السادسة مساء: نقاش حول نظريات المفكر والمنظر الادبي الفلسطيني إدوارد سعيد وإسهاماته الكبيرة في مفاهيم الاستشراق وما بعد الاستعمار وأثرهما على أشكال الفنون والثقافة، ذلك حسب القراءة المقررة من كتاب "نظريات لتاريخ الفن" "Theory for Art History" للكاتب جاي ايميرلنج. 20 - نيسان، الساعة السادسة مساء: لقاء و حوار مع الفنان الفلسطيني الرائد نبيل عناني يتخلله حفل توقيع كتابه الأخير بعنوان" فلسطين، أرض وشعب"
27 - نيسان، الساعة السادسة مساء: جولة وحديث مع الفنانة ليندا خوري مديرة دارة التصوير حول مجريات مهرجان الصورة الثامن في عمان- 2019 "ترحال" والذي يضم العديد من المعارض الفنية والفعاليات في مختلف دور العرض والأماكن العامة في العاصمة. 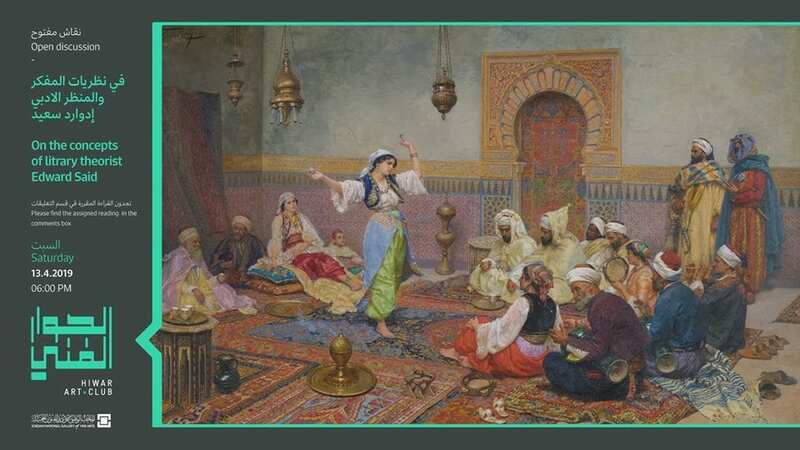 13 April, 6:00 pm: Discussion on the theories of the Palestinian intellectual Edward Said and his contributions to the concepts of Orientalism and Post colonialism and their impact on forms of art and culture, according to the reading from the book "Theory for Art History" by Jay Emerling.